From Co-Creators Marti Noxon and Sarah Gertrude Shapiro, and starring Shiri Appleby and Constance Zimmer, the provocative drama gives a fictitious behind-the-scenes glimpse into the chaos surrounding the production of a dating competition program. 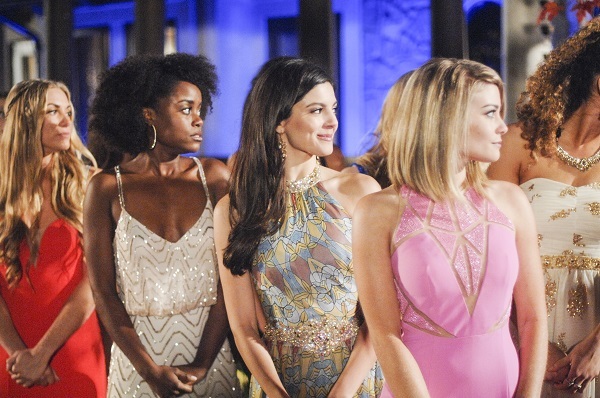 Set against the backdrop of the hit dating competition show Everlasting, Season 2 of UnREAL is led by flawed heroine Rachel Goldberg (Appleby), who returns as supervising producer, renowned for her skills manipulating her relationships with, and among, the contestants to get the vital dramatic and outrageous footage that the program’s dispassionate executive producer, Quinn King (Zimmer), demands. What ensues once again is an eye-opening look at what happens in the outrageous world of unscripted television, where being a contestant can be vicious andbeing a producer is a whole other reality. Returning as series regulars are Craig Bierko as Everlasting’s creator, Chet, who is on a quest to reclaim his full power on set; Josh Kelly as Jeremy, Everlasting’s director of photography; and Jeffrey Bowyer-Chapman as Jay, a field producer whose ambitions run far beyond the show. Everlasting’s new suitor Darius Hill, an All-American football star, will be played by B.J. Britt. On tonight's episode, titled "War," Quinn has recently promoted Rachel to produce season 14 of Everlasting and Rachel sets out to change history by casting the first African American suitor. When Chet arrives back on set to reclaim control of the show, Rachel and Quinn find the new suitor being swayed by Chet and his new vision. Next week (June 13), in "Insurgent," Quinn and Chet start producing two different versions of Everlasting, forcing the crew to choose a leader as new alliances are formed. Rachel feels her promotion slipping away as the crew is divided and takes matters into her own hands, yielding unexpected results for everyone.